Many of today&apos;s cruising powerboats come from production yards, most of which offer more than one model in an attempt to satisfy various budgets and owner needs. The typically healthy lists of options for these boats provide potential buyers an assortment of choices, all ways to make one boat more unique, more personal, more "mine." Nowhere can I say I&apos;ve seen this more true than on Oviatt Marine&apos;s new series of Grand Alaskan cruisers. The new series spans vessels from 53 feet up to a whopping 115 feet. All have a raised pilothouse, a Portuguese bridge, and some reflect Arthur DeFever&apos;s trademark flared bow. But beyond simple, basic design traits, each boat comes together as a unique yacht, reflecting the style ideas of each owner. I&apos;ve been on four different Grand Alaskans, and apart from some similarities in general layout and profile, each boat is markedly different. It&apos;s really quite amazing to see this from one yard. Layouts include two, three, or four staterooms, and finish alternatives encompass lavish varnished teak, to lighter blends of hardwoods, to contemporary padded fabric with wood trim. I thought a high-level boat tour might be in order, showing various elements of several boats that are similar yet each unique. Perhaps you&apos;ll also agree that if the Grand Alaskan fits your style and ideas of the ideal cruising yacht, then Oviatt can build one just for you...no matter what your requirements. In the middle of the Grand Alaskan series, the 60-footer represents a good choice for a couple planning extended cruising and living aboard. Cut back a few feet at the stern, or add a few feet: both options are possible with the Grand Alaskan. The look of the boat is traditional, with classic lines. Nothing about the boat&apos;s profile screams drastic change or styling, just conservative yacht design. A full-length rub rail runs from the stern forward to just under the Portuguese bridge, where the flare of the bow takes over. While it does not have the heft of some rails found on other cruising yachts, it should do the job of protecting the hull during docking and fuel stops. The rub rail stops at the stern, which blends into an integral swim platform with molded steps up to the aft deck. It is very civilized, and will prove a popular feature for owners who dive, snorkel, or otherwise enjoy the water while anchored in paradise. Dockside folks won&apos;t notice it as much. Pity. Some Grand Alaskans have all teak decks and varnished teak trim, others keep brightwork to a minimum, and keep wood for the interior. Again, it&apos;s up to the owners. It was immediately clear these boats are a good choice for tall people. I found a minimum headroom of 6&apos; 5" throughout the boats, even on covered side decks. Speaking of big, the foredeck is huge. The Portuguese bridge is 35 inches tall, and it is 13 feet from this bridge to the bow, which is 9 feet off the water. Two bow rollers are incorporated into the bow&apos;s deck mold, and all cleats are well positioned. A big foredeck. Port and starboard doors in the bridge just outside the pilothouse doors allow entry from a high pier, as when coming aboard at low tide. Interestingly, there is no access to the boat deck from either side deck or the aft cockpit, which I think adds to the open feeling of moving around the Grand Alaskan 60. In addition, by eliminating that traditional, but user-unfriendly vertical ladder and its overhead hatch, the aft cockpit is even more protected and inviting, for chairs and tables. Stepping through the two aft saloon doors brings one into the comfort and luxury of a large boat interior. The first boat I went aboard had a traditional, satin-varnished all-teak interior; a second traded the dark teak for lighter hardwoods, complete with plush carpeting; a third combined teak with fabric-covered panels for a contemporary, yet timeless look. Such diverse interior treatments allow each Grand Alaskan to be as unique as her owners. The standard saloon is 13 feet long, and averages 12 feet wide as it narrows slightly aft. A standard saloon would have an L-shaped settee on the port side, with either a fixed table, or convertible table that extends for occasional guests. Built-in furniture, opposite the settee, adds storage and entertainment center possibilities, while allowing for a couple of comfortable easy chairs. The design has large saloon windows that bring in plenty of light (and the rest of the world) to those lounging inside. Windows are located 40 inches off the sole, and the settee cushions come up to them. The standard saloon layout has a 45-inch-high breakfast bar forward of this settee on the port side, separating the galley from the saloon, while including the cook in all social activities. On one of the Grand Alaskan 60s, the galley measured a square 8-feet by 8-feet, taking up a large portion of the boat amidships. The galley layout and equipment on all Grand Alaskans would be more than adequate in a full-sized home, with 36-inch-high counters, large, deep sinks, and full complement of domestic appliances. For the kind of cruising the Grand Alaskan is designed for, the galley is superb. It lacks nothing, from counter area to storage of pots and pans. A day head is standard. Forward of the galley is where the boat&apos;s optional layouts really separate one boat from another. The standard two-stateroom layout has the owners&apos; stateroom amidships, with guest cabin forward in the bow, each with ensuite heads and enormous hanging lockers and drawers. The master stateroom features a fullsized king bed, and the guest stateroom has a queen-sized island berth. There will be no camping on this boat! Another standard layout, but with three staterooms, rearranged the spatial layout of the master stateroom, and gives up some locker space for an additional cabin of stacked single berths, while keeping the forward guest cabin with its island berth. An additional three-stateroom layout is available which allows engine room access from the galley and lazarette rather than the master stateroom and lazarette on the standard arrangement. A four-stateroom layout is also available, which breaks up the forward guest cabin into two smaller cabins. For larger families on the go, this accommodation plan may be best. Despite different entry points into the engine room, all include a heavy, dogged door as access. I measured between 64 inches and 56 inches of headroom as I moved around the engine space. The engine room is 20 feet long. Four large fuel tanks are standard on these boats (at least in the 60-footers), and fuel capacity can be specified from 1,350 to 2,000 gallons, depending on engines and owners&apos; range requirements. Every boat I toured is outfitted with Naiad active fin stabilizers, and the choice of one or two gensets is a function of owners&apos; needs for air-conditioning. Serious soundproofing is evident throughout the engine room, even on the underside of the lift-up hatches in the saloon sole, which need only be lifted for major engine work. All regular maintenance jobs, fluid checks, and systems inspection are easilym completed from within the engine room. This is a big engine room in a big boat. Even with two large diesel engines, there is still enough room to move around, and fuel-management plumbing is located in a reasonable location. Sometimes the clutter of engine room systems results in an intimidating nightmare for the new boat owner. In the Grand Alaskan, the sheer size of the space makes for more orderly system installations. 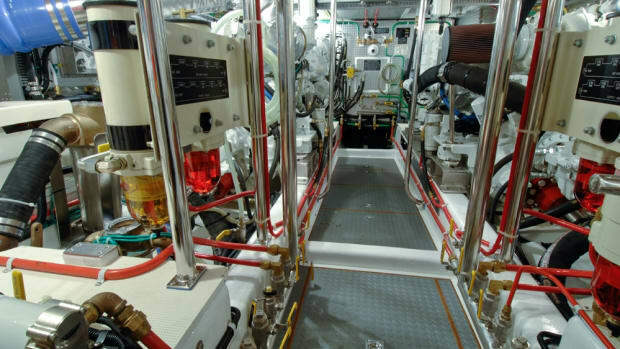 It is a well-done engine room, even if it does not have the same headroom as the rest of the boat. It is Oviatt Marine&apos;s design philosophy that each boat must have a roomy, comfortable pilothouse. The Grand Alaskan series is no exception. It is indeed the command center of the boat, and on one 60-footer, measured almost 11 feet long by more than 11 feet wide. The Grand Alaskan offers a full helm station, with L-shaped settee behind, and an abundance of console and locker space for electronics, computers, chart work (yes, there is a full-sized chart drawer), and communications equipment. Headroom is two inches shy of seven feet. Two dogged doors open out to the side decks behind the Portuguese bridge, and an aft, sliding door opens for protected access to the flybridge and boat deck. The normally covered flybridge is a delightful location for under way exploration. Seating is more than enough for owners and their guests, and the space makes it inviting to watch the world go by, even at anchor. Visibility is outstanding, as I could easily see the bow rail from the flybridge helm chair. The boat deck, 16 feet wide on the Grand Alaskan 60, is perfect for storing a 14-foot Novurania RIB with 50-hp Yamaha outboard, which comes standard with the yacht. Speaking of standard equipment, the Grand Alaskan comes with stabilizers, bow thruster, and two gensets. All flybridge seats lift to reveal lockers. I can&apos;t imagine running out of space on this boat. Back in the pilothouse, I sat in the standard Stidd helm chair, and reflected on the perfect use of the Grand Alaskan. Fitting her name, the boat would certainly be comfortable cruising the Pacific Northwest up to Alaska. Three of the forward-facing windows have wipers, and visibility forward and to the sides is excellent from the inside helm. Even running in drizzly weather, the open spaces of the interior would keep cabin fever at bay. And in opposite waters, say Mexico, the Bahamas, or in the Caribbean, the Grand Alaskan will fare just as well. Its wide decks, wonderfully thought-out swim platform, and minimal exterior teak will make island cruising a pure delight. It is also a boat fit for a couple blessed with a large family-not necessarily in number but in size-as tall people will be very comfortable on this series of cruising yachts. Personally, I have always thought of Gary Oviatt&apos;s creations (which have in the past all been from Arthur DeFever but now include several other naval architects) as following a middle road. On one hand, the boats look at home among expensive motoryachts, which offer extraordinary accommodations, yet rarely leave the security and no-hassle living of a marina. Such vessels require a host of umbilical cords for survival. Not so on Oviatt Marine&apos;s Grand Alaskan. The boats also looks quite content among the bluewater veterans that define the passagemaking concept. Outfitted to live well under way or in a remote anchorage, such cruising vessels usually trade home-style living space for offshore seakeeping ability. But again, this is not the case with Oviatt Marine&apos;s Grand Alaskan. Granted, she may not be an offshore ocean crosser, but then again, the people who buy such a boat do not choose to do so. Should they decide to cruise another part of the world, they are more likely to ship their boat via the many transportation services that specialize in this growing yacht-moving business. Gary Oviatt is looking far into the future for the course of Oviatt Marine. No longer content to be a successful yacht brokerage, Gary will soon be moving his entire Florida operation into a new facility at Fort. Lauderdale&apos;s Lauderdale Marine Center. This major step forward is a serious commitment for Oviatt Marine, and makes a statement about where the company is headed. The new facility will have office space for a full-time staff of quality-control people, who will oversee construction of each new yacht. New office space for inhouse naval architects and engineers will allow use of computer station CAD and digital imaging to replace hand-drawn faxes and artist sketches for changes and clarifications between owners and the overseas yards that actually build the boats. Gary isn&apos;t planning to let go of the brokerage end of his business any time soon, either. The Oviatt expansion includes space for a larger broker staff, who will help manage the growing support needed in the used trawler and cruising motoryacht market. As for the Far Eastern yards creating these boats, that is a story onto itself, but a mention is warranted nonetheless. The 53-, 60-, and 64-foot pilothouse models are built at the Tania Yacht Co., Ltd., in Kaohsiung, Taiwan. The larger 75- and 80-foot Grand Alaskans, as well as several models of Oviatt&apos;s flush-deck motoryachts, are built by Transworld Boat Building Co. in Taipei, Taiwan. And Gary is also working with Taiwan&apos;s Vi-Tech Yachts to push the envelope even further, making extensive use of vacuum bagging and other high-tech construction techniques. Gary Oviatt would like the company to reach a point of critical mass. At that point, its engineering, naval architect, and quality control support will allow him to use any fiberglass boat builder in the world. His goal is to build cruising boats without needing complex, long-distance project management. Gary&apos;s ultimate goal is to have Oviatt Marine design and build boats that rival the highest quality yachts. It is a lofty goal, but backed by years in the business, and taking the right steps to get there. For a lot of sensible reasons, Oviatt Marine&apos;s Grand Alaskans seem right for cruising under power. The designs look good, and everyone involved keeps pushing for higher quality. For the vast majority of people able to purchase this size and caliber cruiser, the Grand Alaskan is worth a look. The boats are proof that, given today&apos;s modern comfort systems, a large boat really can have it all.